Certainly this cover grabbed my full attention even before I was treated to the poems inside. "Heart is Not Ten or Twenty" is the title and the artist, S. H. Raza is a fascinating Indian painter who lived much of his life in France and then went back to India consciously ready to reinvent his art. 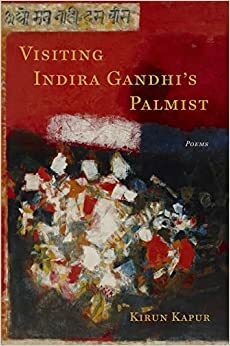 In Visiting Indira Gandhi's Palmist the reader understands the importance of (re)invention. In Kirun Kapur's debut collection, family stories of emigration and war shake hands with Chips Ahoy and the afterlife. There is much to admire in this heady mix of three generations moving across the page. A sense of (dis)location helps to create Kapur's surreal voice that this reader finds very appealing. The infantry is restless. Rumors in the street. he leaps, he presses across the map. Clearly Elizabeth Bishop's "The Map" and "Geography III" are also pressing on this poem --- in a very good way. The poem is filled with internal rhyme "street / mutiny / Greece" and there's an iambic ghost throughout much of the poem. I admit that the poems looking back on the speaker's father are among my favorite. The intermingling of history and family, father and daughter is a personal preference. Having admitted that, I almost want to take it back because what I love about these poems is how well they're written. No sentimentality; no easy escapes. The poem "Nobody Nation" is written in flash points of an extended compass: west, east, north, south, and pacific. The notes at the back of the collection offer that Kapur's poem was inspired by Derek Walcott's famous line, "I'm nobody or I'm a nation" in his amazing poem, Schooner Flight. In Kapur's five sections we watch as a child learns the ugly indignities of racism along an Arizona highway, in a history book, and while working for a wealthy couple. Yet, in the last section the father is sworn in as (we assume) a US citizen. And he has the last word: I keep the good lines for myself. From the independence of a nation as India breaks away from Great Britain, to the growth of an educated family living in exile, this book offers me (and I suspect many American citizens) a new window into the world. These are complex poems that I've returned to several times over the last few months. Poems that I believe will stay with me for a long time to come. Kirun Kapur is a multi-talented poet able to write well in many different forms. This will benefit her (and us as readers) as she continues her career. This is a poet we are sure to hear more from. The poems are necessary --- smart and funny. And very clearly poems for these times.